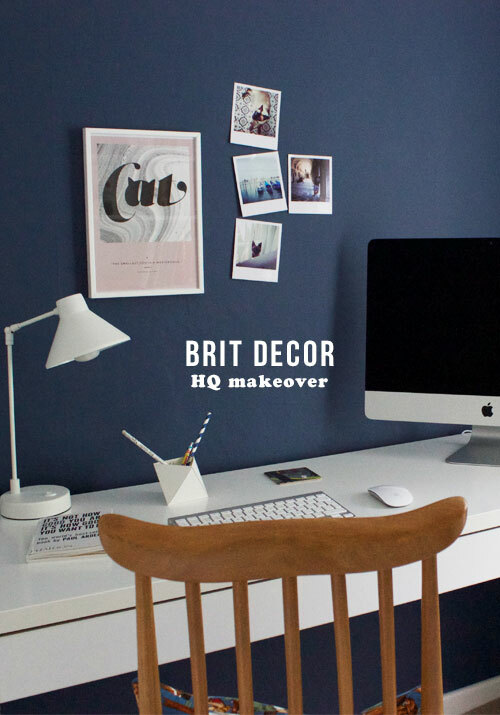 I've been blogging about the Brit Decor HQ makeover for some time now with teasing glimpses of paint samples posted for my instafriends, along with several handmade projects featured here. To re-cap; there's been the Origami lampshade, the hand printed geo desktop pot, dip-dyed curtains, and my newest fad, Polagrams. However, this project hasn't been all about the new. I've deliberately included some familiar elements too with a skilfully made cowgirl cushion from the lovely Jon Sanderson at The Cantin' Patch, and my vintage Ercol Goldsmith chair - well you'd expect nothing less than a British design classic in the Brit Decor office, right? Blue is a long-time favourite colour of mine because it awakens something inside me and sets my creative pulses racing, which was always going to be a prerequisite for my workspace. In the end, Farrow and Ball's Stiffkey Blue (no.281) made the cut for its distinctive blue/grey shade. I love the dreamy depth of this blue and the way in which it creates the perfect contrast to my white desk and accessories. I decided to further crank up the element of drama created by this feature wall by adding some moody greys - the combination of the blue, white and grey evoke a clear sense of stormy skies. A major design factor that I had to take into account for this room was its compact dimensions, so there needed to be plenty of light to compensate for the darker tones. To achieve this I whitewashed the remaining walls and used semi-sheer curtains to maximise the inflow of natural light. There's also the sleek white Bobby desk lamp from Habitat and some cunningly concealed IKEA strip lighting behind the desk (great for uplighting the gallery wall above). And not forgetting my handmade origami light pendant, complete with vintage twine electric flex. In terms of how this workspace is going to function on a day-to-day basis, I also needed to incorporate the comfort factor. For this design element I wanted to keep it casual and so I threw down some plush grey velvet scatter cushions next to my bookcase and Bose sound dock, this way I know there's a quiet corner waiting for me whenever I need a break from my desk. Thanks guys, I think it's fair to say I'm obsessed with Ercol lately!